We even make taking out the trash and recycling easier! Shelves that Slide is proud to offer top quality sliding trash and recycle systems from top suppliers such as Rev-A-Shelf. We say we can help organize your life and now we can help organize your waste management as well. That garbage can does not have to sit in the middle of your kitchen floor. 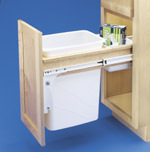 We have small waste management systems that fit cabinets as narrow as 10". We also have large rev a shelf sliding recycling centers with three color coded bins and a canvas bag. You can also use one of our medium or tall side slide out shelves and add your own waste container. Or order a fully assembled rev a shelf sliding garbage system complete with the polymer garbage containers. 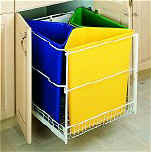 We even have rev-a-shelf systems that come with Rubbermaid waste containers. There are waste management systems to handle trash in vanities. Other pull out waste containers have automatic lids that close when the cabinet door is closed to lock in the odors. One system has a heavy duty gasket to seal in trash smells. We have small stainless steel systems like those used in medical buildings and doctor's offices. Our pull out trash systems and waste containers are available for cabinets with openings under 9" wide or a recycling center that fits a cabinet with a minimum opening of 21 3/4". If you don't see what you are looking for let us know and we will look for the pull out waste center that you want. Whether it is a kitchen shelf or a bathroom shelf or even an office shelf we have the sliding shelves you are looking for.